Last week my wife and I went on vacation to San Francisco. We were there to catch a U2 concert, which was amazing. We also took in lots of other sights. 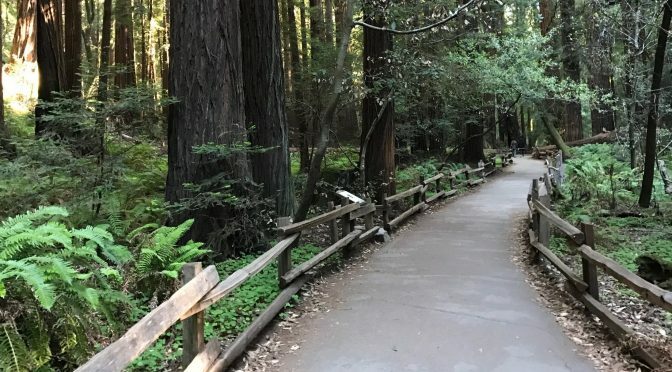 But my favorite—no big surprise—was Muir Woods. 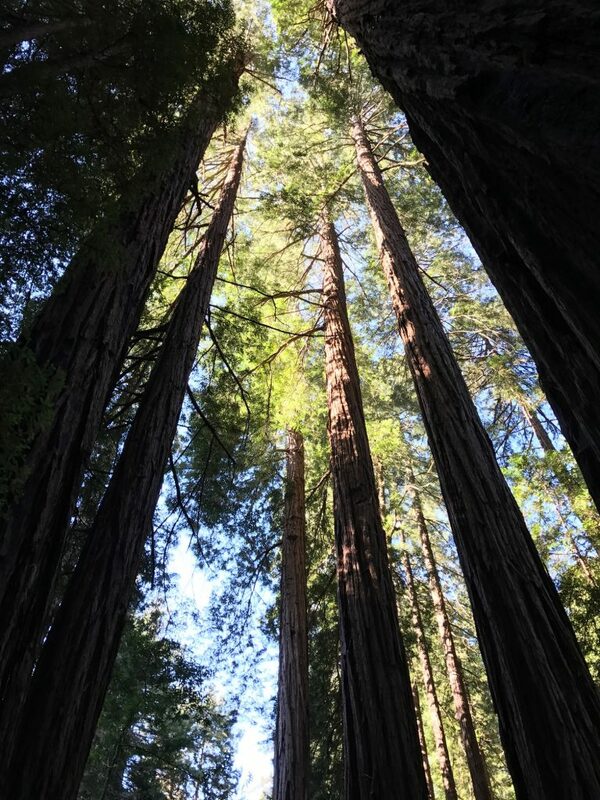 It’s an incredible place filled with 500-year old trees that tower more than 350 feet above the quiet forest floor. Last week I picked up the National Parks documentary by Ken Burns from the library. I heard about it when it was first on PBS, but who has time to sit down and watch 12 hours worth of documentary on PBS? I’ve been watching it for the past week and falling in love (again) with America’s best idea, the National Park Service. It’s amazing what it took to create the National Parks. It started in the 1860s with the preservation of Yosemite and officially began in 1872 with the world’s first national park, Yellowstone. The idea of preserving something for the people was a uniquely American idea. But that doesn’t mean it came easily. People fought against the National Parks, not just in the 1800s, but even recently. And once we had the parks, we had to fight even harder to save them. The idea that the animals should run free and wild wasn’t a natural conclusion. It was something people had to fight for. After watching the entire documentary and learning about the history of the parks, I learned a few things. First, practically every park was saved because somebody stood up and demanded action. They rallied the troops and wrote letters and raised money and did the hard work that had to be done to save a section of land from developers. It’s hard to find a park that was saved without a fight, without somebody wanting to develop the land and somebody else wanting to save it for our children and our children’s children. We owe much of our national heritage to these kinds of heroes. And not just national parks. If there’s a state park or beautiful city park in your area, somebody had to fight for that. Be thankful. Second, we stand on the shoulders of giants in terms of accumulated knowledge. I kept finding myself dumbstruck by the people fighting against the parks and the silly things people would do in the parks, from exterminating predators in Yellowstone to grazing sheep in Yosemite. There was no understanding of the value of nature or the way an ecosystem works or that feeding a bear isn’t good for the bear. These are simple ideas that seem like common sense to me. But I realized that’s because I was raised and taught those ideas. Nobody had those ideas 50 years ago and it seemed like a good idea to throw out food so the tourists could watch the bears. Rather than be frustrated with our ancestors who didn’t know anything, I’m grateful for my inheritance of accumulated knowledge and wisdom. Third, I want to go back to the National Parks. Growing up we spent nearly a decade doing the traditional summer vacation and hitting up the National Parks of the American West. We hit Rocky Mountain National Park nearly every year, but each year we’d go somewhere else different and I’ve racked up quite a hit list: Yellowstone, Grand Tetons, the Badlands, Mount Rushmore, Mesa Verde, Black Canyon of the Gunnison, Bryce, Zion, Monument Valley (which isn’t actually a National Park, but a Navajo Tribal Park), Yosemite, Sequoia, Death Valley, Grand Canyon, Canyon De Chelley, Painted Desert, Petrified Forest, Carlsbad Caverns, Whitesands and probably more (and OK, some of those are National Monuments or whatever other designation they have, but they’re still in the National Park system). 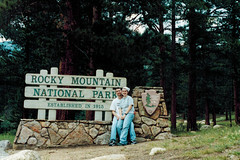 In 2003 Abby and I went back to Rocky Mountain National Park and it was the greatest camping experience of my life (and campfires weren’t allowed thanks to a wild fire raging nearby). 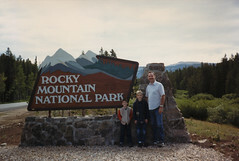 I want to take my kids to the National Parks, just like my parents took me, and my grandparents took my parents. Yesterday I went for a 20-mile bike ride. I think that’s a little too much distraction. 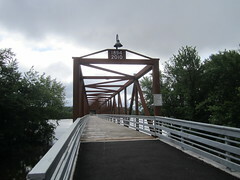 My goal was to make it down to the new Rock Island Swing Bridge in Inver Grove Heights that’s been converted to a pier. The ride down was great. The ride back? Not so much. I was pleasantly surprised to discover that the trail I cataloged for a National Park Service trail guide back in 2000 has been extended almost all the way to the Rock Island Swing Bridge. There are plans for more amenities at the bridge, including a 55-acre park that should make it even more of an attraction. So what is it? It’s a 670-foot pier that extends halfway out into the Mississippi River. Originally built in 1894, the double-decker bridge carried trains and vehicles across the river. Trains went on top and vehicles on the bottom. Supposedly John Dillinger used the bridge as an escape route when evading the FBI. It was closed to trains in 1980 and traffic in 1999. In 2001 the Coast Guard ordered its removal as a potential disruption to river traffic. 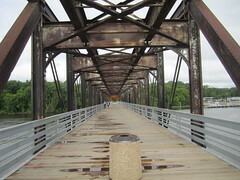 A section of the eastern half of the bridge collapsed in 2008 and demolition was imminent. In 2009, a month before the scheduled removal of the western half of the bridge, the governor and legislature offered a reprieve, likely thanks to a bridge tour the National Park Service hosted in 2008 to gauge public interest. Nearly 700 people showed up and waited in long lines all day to get a chance to walk on the old bridge. 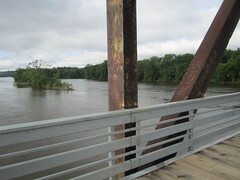 The bridge (at least the western half) was finally saved thanks to a federal grant, state aid disaster funds, county and city funds, the Minnesota Historical Society and a local fund drive, totaling $2.3 million. Construction was delayed by flooding and then a fire, but last week the pier opened to the public. So is it worth it? That’s the question another Rock Island Swing Bridge visitor posed when I was there. I looked around for my answer. This is it. Where else can you find these views of the Mississippi River? I’m not aware of any other pier like it in the Twin Cities area, and maybe not on the rest of the Mississippi. It gives Inver Grove Heights public access to the river (most river front property is either private clubs or industrial land) and a major destination.